Fuel Safe's drop in solution for your 5th generation Camaro racing cell. This 20 gallon cell comes complete with a .063 TIG welded aluminum container, an FIA-FT3 approved Pro Cell bladder with foam, a custom Camaro fill plate with a 2.5" screw cap, sending unit provision, -6 pickup, a -6 vent with rollover protection, a -6 return fitting. Features an a collector with three CV100 check balls, fuel directing fins and a -8 low profile pickup. Fuel Safe's 5th generation Camaro racing cell is designed to fit in the factory fuel tank location. 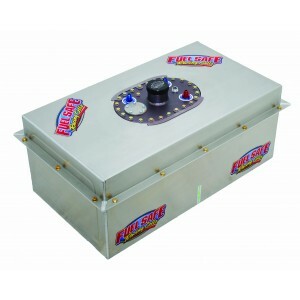 The 20 gallon cell comes complete with a .063 TIG welded aluminum container, an FIA-FT3 approved Pro Cell bladder with foam, a custom Camaro fill plate with a 2.5" screw cap, sending unit provision, -6 pickup, a -6 vent with rollover protection, a -6 return fitting. Features an a collector with three CV100 check balls, fuel directing fins and a -8 low profile pickup.